Want a more interactive game day experience? We have it covered from all angles! Instagram: @indianapoliscolts for behind the scenes photos you can’t get anywhere else: stadium shots, player photos, and other pre-game happenings. 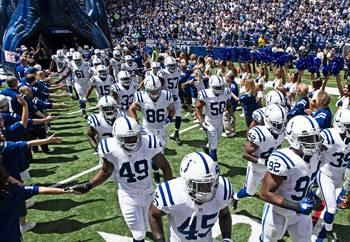 Twitter: @nflcolts for stadium and score updates, as well as teams news. Facebook: facebook.com/coltsfor the Taco Bell Pregame Press Pass, score updates, and more. Follow all of the game action online, browse game photos, and read quarterly blog updates at the Toyota Game Center. Check out Instant Access for the first opportunity to hear what Coach Pagano, Andrew Luck, and top players have to say about the game. Check back later for: more videos, articles, and photo galleries!! The letter ‘R’ that is often seen next to tight Dwayne Allen’s name is there to indicate his inexperience in the NFL. But there is no time to grow up at the tight end position with five players combining for a total of three years of NFL experience. The importance of the tight end position in offensive coordinator Bruce Arians’ offense was made pretty clear when the Colts chose tight end Coby Fleener and Allen in the second and third rounds of the 2012 NFL Draft. Both of the rookies have been utilized in a number of ways during training camp and Allen said his position is still working towards their potential. For those that watched Arians offense put up 38 points in the preseason opener against the Rams, it might be hard to find mistakes in such a performance. Not for the members of the offense, though. “Outside looking in, you only see the good, you only see the big plays. You don’t see all the little things that we know that we can correct to be even better,” Allen said. Allen and the young tight ends will be introduced to a new experience this week heading to their first road environment in Pittsburgh. “Good teams are able to win on the road, so I’m looking forward to building on what we did in the first game and getting better. Tough road wins are tough, even tougher in the NFL,” Allen said. Early in training camp, Allen admitted he was a bit shocked when the Colts took him at the top of the third round. How him and Fleener would co-exist was a concern to him, but those worries were quickly put to rest when he learned who is offensive coordinator was. Arians has a history of making the tight end a vital part of the offense and that role has head coach Chuck Pagano excited about the future of the position.